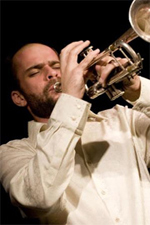 Amir ElSaffar is an accomplished trumpeter who has collaborated with various artists, including Cecil Taylor, Rudresh Mahanthappa, Vijay Iyer, and Daniel Barenboim,and was the winner of the 2001 Carmine Caruso International Jazz Trumpet competition. In 2002, ElSaffar put his New York career on hold to immerse himself in the music of his father's ancestral past, the Iraqi maqam. He went on a tremendous quest, traveling to Iraq, throughout the Middle East and to Europe pursuing masters who could impart to him this centuries-old oral tradition. He quickly became versed in maqam, and learned to play the santoor (Iraqi hammered dulcimer) and to sing, and now leads the group, Safaafir, the only ensemble in the US performing Iraqi Maqam. He has also created new techniques for the trumpet that enable microtones and ornaments that are characteristic to Arabic music but are not typically heard on a trumpet. In 2006, upon receiving commissions from the Painted Bride Arts Center in Philadelphia and from the Festival of New Trumpet Music (FONT), ElSaffar composed Two Rivers, a suite that invokes Iraqi musical traditions and frames them in a modern Jazz setting. His 2007 Pi Recordings release, Two Rivers, was described by All About Jazz as "a stirring example of the creative possibilities of international jazz in the 21st century," and by the Philadelphia Inquirer as "hypnotic and arresting." It appeared on the Boston Globe's Top 10, Philadelphia City Paper's top Jazz releases, and was selected by the Village Voice critic's poll as the runner-up Debut jazz release of 2007.ext. In 2008, Amir received a commission from the Made in Chicago Festival to assemble a 17-piece ensemble and write for it arrangements of the Two Rivers Suite. The performance, which took place at Millennium Park, drew an audience of over 5000 people. Later that year, he started a new collaborative quartet with pianist Vijay Iyer. ElSaffar has also composed for theater projects, including the Wilma Theater's productions of Heather Raffo'sNine Parts of Desire and Wajdi Mouawad's Scorched. He will be performing with Raffo, singer Gaida Hinnawi, and others at the Kennedy Center as part of the Arabesque Festival in March. He has composed, improvised, and performed on several film soundtracks, and appeared in Jonathan Demme's Oscar-nominated film, Rachel Getting Married.